How can you add new models to the game? I do have 3D Studio Max, but I don't know how to convert the models to something that can be used in this game, if that's even possible at all. I've heard about zModeler, but I don't know where I can get this (for free preferably; I'm a student and I don't have that much money). The things I want to change are signage (which is in some countries downright unrealistic or confusing (especially in France and Germany)), power pylons (the current ones don't fit the country style 90% of the time) and streetlights (only Belgium and Poland are correct, and in lesser extent, Luxembourg. The rest from the standard map looks off). How did you manage to get different road markings for Norwegian and Swedish roads? I'd like to apply such a different road marking in the Netherlands too so they look like this. This would make the Netherlands more typically dutch. It may be even possible to change the painted arrows too, so we can get the corresponding painted arrows for each country. Thanks that you like and appreciate our work. The things that you are describing were one of the most time consuming alterations we have done in our mod. MandelSoft wrote: [*]How can you add new models to the game? We use Zmodeler3 and both pay for it (out of own pocket). It is payware only and the author deserves it because the software is great. You can also use Blender with a Blender2SCS plug-in but I don't like the interface. The biggest problem in converting models to work in ETS2 is that most software packages render texturs in up to 100 different JPG's. This can't be used in ETS2. Everything must be baked into 1 material (preferably 512x512 pixels) so this means you need to perform texture baking which is very very time intensive (the Malmö tower cost 2 days). MandelSoft wrote: [*]How did you manage to get different road markings for Norwegian and Swedish roads? This is a mixture of heavily modifying lines.dds, road.sii, roadlooks and hacking of textures (replace existing materials with new road materials). In some cases we painted the lines on the road texture (baked into the DDS). In fact, stoplights in Scandinavia are more similar to the style used in the UK than in the rest of Europe. Again, I beg to differ. I know modeling is hard, but I can clearly see that you used the modified version of the Belgian lamp posts for Sweden. The post itself looks OK, but the lamps themselves are very, VERY un-Swedish. Signs like this make me think that two lanes continue, while only one lane actually does continue (also, this type of interchangs is also not really Swedish. I personally hate these one-lane-continues interchanges, because you can't find them on motorways here anywhere. ScuL wrote: We use Zmodeler3 and both pay for it (out of own pocket). It is payware only and the author deserves it because the software is great. You can also use Blender with a Blender2SCS plug-in but I don't like the interface. Hmmm, that's a bit too bad that there's no free version available of Zmodeler or some plugin for 3DS Max I could use. But on the texture wrapping front: I was already expecting that; it would be similar to SC4 Automata modding (cars, trains, planes and such), which can also use only one or a few textures, and you have the be careful with wrapping the UV co-ordinates. ScuL wrote: This is a mixture of heavily modifying lines.dds, road.sii, roadlooks and hacking of textures (replace existing materials with new road materials). In some cases we painted the lines on the road texture (baked into the DDS). The usage of the signage has to do with SCS incorrect and unrealistic implementation of motorway junctions. It can't be helped unless they were to change the game, but in the end it is a game. I disagree with the other points you raised. Then why don't you apply signage to make the situation clear instead of blaming it on SCS that their interchange designs make no sense? It is no use for the player to be misguided. Just use a proper sign showing that only ONE lane continues and then that will do the job for now. Besides, you have managed to make new modular prefab pieces too, so custom interchanges shouldn't be a problem, so I don't get your comment on that motorway junctions can't be helped. Custom intersections would be a bit harder to implement, but I think not impossible. Because no such signage exists in real life as these type of motorway junctions don't exist. SCS has done the same in France. 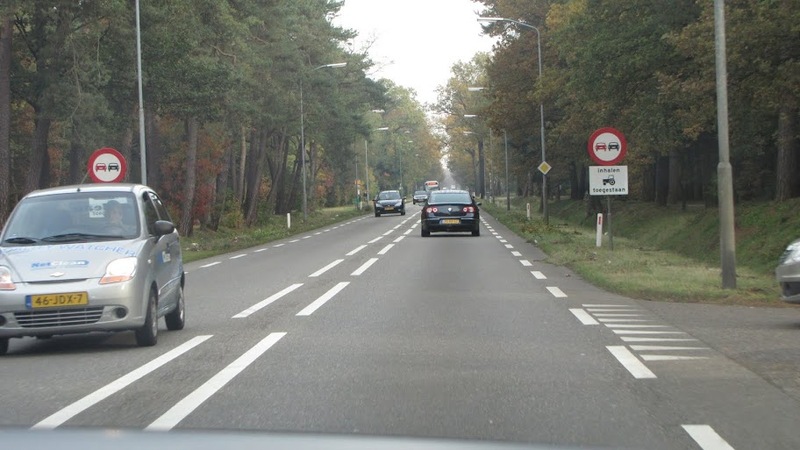 In many countries the double arrows only give a general sense of direction rather than implying they are there for 2 lanes. This is valid for both Denmark as well as Sweden and trust me I know I have been to these countries 30+ times. So I ask you again, can you give a counter-example to proof me wrong? It's a nice mod you've made that includes Scandinavia, but I have to agree with MandelSoft on many of his points. Since I'm Swedish I know what roads and whatnot in Sweden looks like, trust me. You have the lamp posts wrong, but that's okay with me. Your Swedish signs are seriously f-ed up. Nowhere in this country do we have more arrows pointing in a direction than there are lanes. You got the colours somewhat right at least. The arrows are too big in comparison to the text, and the white capital text should use the TRATEXNEGVERSAL variant of Tratex. The arrows also need to be two ahead and one turning left, the turn integrated into the ahead arrow, like the example MandelSoft posted. We don't sign "Helsinki", that's the Finnish name, we sign "Helsingfors". There's probably more details, but I think this will suffice. Again, it's admiriable that you want to recreate the Scandinavian countries, but if you're so dedicated that it seems you are, do your research properly instead of saying "you're wrong, we'll do it this way" all the time. I've modified the layout of these signs a bit. Heck, I even use custom arrow textures with it and it works just fine! anonymson wrote: It's a nice mod you've made that includes Scandinavia, but I have to agree with MandelSoft on many of his points. Since I'm Swedish I know what roads and whatnot in Sweden looks like, trust me. Let me start by saying that I'm not trying to be an arse I simply disagree with the criticism as I am a very experienced visitor of Sweden and everything has been done based on thorough research and real life experience. I've never lived in Sweden but I went there for the first time in 1989 and I've been there nearly 30 times, I work for a Swedish company now and speak Swedish daily and fluently. I've seen Sweden from the corners of Skåne to roughly about Dalarna and am extremely familiar with Swedish traffic systems & road signage. anonymson wrote: [*]You have the lamp posts wrong, but that's okay with me. OK there is a mistake here. We did model the Swedish traffic lights correctly but they have been switched off last minute because they were causing stability problems and we may re-release them in a future update. Please note that we have not modelled the new 2012 style "round" lights with LEDs as they are not very frequent (yet). [*]Your Swedish signs are seriously f-ed up. Nowhere in this country do we have more arrows pointing in a direction than there are lanes. You got the colours somewhat right at least. The arrows are too big in comparison to the text, and the white capital text should use the TRATEXNEGVERSAL variant of Tratex. The arrows also need to be two ahead and one turning left, the turn integrated into the ahead arrow, like the example MandelSoft posted. You're wrong there, I have modelled this sign upon Google Streetview images of actual signs in cities (predominantly Stockholm, Göteborg anywhere with lots of lanes). The amount of navigation signs created for Sweden exceeds 20 types, this is nearly double from what SCS have created for the other countries. There are too many specific situations (and also unrealistic situations like the highway splitting junctions) to accommodate correct arrows in every situation. PLUS you probably don't realise that the place where arrows are stored (symbol.dds) has limited space to fit any new type of arrow (such as 1 arrow branching off from another one). anonymson wrote: We don't sign "Helsinki", that's the Finnish name, we sign "Helsingfors". There's probably more details, but I think this will suffice. There is an EU-directive which states that European city names in other countries must be referred to in their local names. 10 years ago you would still find signs to "Keulen" and "Aken" in NL, now they have been replaced with "Köln" and "Aachen". As a result of this most signage in Sweden towards Helsingfors has been replaced with Helsinki and we stuck with that rule.